I of course agree to the six rules for children in order to prevent any kind of bad experience, so that they can keep their boundaries. But to be honest, I want to talk about meeting strangers in the life as youth and adult. Globalization is based on meeting strangers, strange people, strange cultures, strange behavior. So, to survive or ……….to have success in times of globalization you have to build up competence in relating to strangers just saying No can be very helpful for small children and can be dangerous for youth and adult. You can’t avoid to relate to strangers, meet them and make contact. Living in a world of marketing, media and magic promises you’re glad (and of course you can’t avoid) receiving something from a stranger. You often even strive for that. Try to find out how interesting it can be to go out with a stranger. Of course talk to your friends and family or colleagues about your experience meeting strangers and enjoying it and being enriched by this. Of course “use the common sense”. 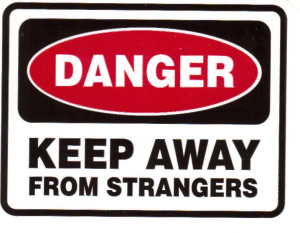 This of course means: Don’t be afraid of strangers, get enriched by experiencing them. Life and (non-)verbal communication happens in between those two packages of six rules. So, try to find out yourself.